France and Croatia brought down the curtain on the 2018 FIFA World Cup. Les Tricolores outplayed Croatia 4-2 in the final of the showpiece tournament, with the French national team winning their second World Cup trophy. However, the Croats are the real heroes of the tournament as nobody expected they would make it to the final of the World Cup in Russia. Led by Real Madrid ace Luka Modric, Zlatko Dalic’s men were producing thrilling performances at the 2018 tournament, but they probably would not have won the silver medal if the likes of Spain and Germany did not play below expectations at the 2018 FIFA World Cup finals. A shocking 2-0 loss to South Korea saw Joachim Low’s men suffer elimination in the group stages of the prestigious tournament, with la Roja losing to hosts Russia in the last 16. The likes of Mesut Ozil, Sami Khedira and Mats Hummels failed to impress at the 2018 FIFA World Cup finals, whereas David Silva is considered the biggest disappointment speaking of the Spanish national team. The teams that played above expectations at the tournament in Russia are definitely Sweden and the hosts themselves. The Nordic side impressed in the group stages, but England eventually proved to be a big catch for Jan Andersson’s troops. The Russians did well to shock Spain in the last 16, but they were more than unfortunate not to win the penalty shoot-out against Croatia in the quarter-finals of the tournament. Both Denis Cheryshev and Aleksandr Golovin impressed at the 2018 FIFA World Cup finals and, as a result, the later was offered deal to join Chelsea. Cristiano Ronaldo and Leo Messi missed yet another chance to win the World Cup trophy, with Portugal losing to Uruguay and Argentina to France respectively in the last 16 of the tournament. The new Juventus signing scored four goals at the tournament in Russia, whereas the Barcelona “magician” was not on top of his game in four matches he played at the World Cup. Speaking of rising football stars, we need to mention Kylian Mbappe, who was named the best young player of the 2018 FIFA World Cup finals. The pacey PSG attacker proved a handful for each and every defenders at the showpiece tournament and many football experts think that he should have won the Player of the tournament award. Nonetheless, aforementioned Real Madrid playmaker Luka Modric won the Golden Ball as he helped Croatia make it to the final. Football fans from all around the globe enjoyed yet another entertaining tournament where 29 penalties were awarded. 169 goals were scored on 64 matches in 12 venues across 11 cities in Russia. Only four players were sent off at the 2018 FIFA World Cup finals, with Croatia winger Ante Rebic committing the most fouls (21). Taking everything into account, France totally deserved to win the prestigious trophy and it has to be noted that Real Madrid defender Raphael Varane became the only player to have won the World Cup and the UEFA Champions League in the current season. HATTRICK WORLD CUP ACCA LANDS! Thanks to a 4-2 win over Croatia France won their second trophy at the FIFA World Cup finals. Despite the fact that the Croats dominated the first half, France took the lead after 18 minutes, with Mario Mandzukic scoring an own goal. Ten minutes later Ivan Perisic scored a beautiful goal to level the score, but Croatia’s celebration did not last long. Antoine Griezman sent an unstoppable penalty past Croatia goalkeeper Danijel Subasic in the 38th minute of the match to make it 2-1. In the second half of the match France totally outplayed Luka Modric and Co, with both Paul Pogba and Kylian Mbappe finding the net for les Tricolores. In the 69th minute of the match France goalkeeper Hugo Lloris made a huge mistake which helped Mario Mandzukic score the second goal for the Croats and set up the final score of the 2018 World Cup final. Belgium and England faced each other in the 2018 FIFA World Cup third place play-offs. Belgium took the lead after four minutes, with Thomas Meunier opening the scoring for the Red Devils. Nacer Chadli played a terrific cross over to the PSG right-back, who found some space inside the box to put the ball into back of the net. The Belgians continued to dominate the match and eight minutes later Kevin de Bruyne wasted a huge opportunity to double the lead. There were no too many clear-cut opportunities to score in the second half of the match, but the Three Lions could have scored the equalizer on two occasions. Eric Dier wasted a golden opportunity to level the score in the 70th minute, with Harry Maguire planting the header that went a whisker wide of the left post four minutes later. Belgium eventually scored the second, with Eden Hazard setting up the final score of the match (2-0) in the 82th minute. Each £1 in this accumulator would reward you £3.16 in return! We are ready for more acca’s! Even though many people expected that Sweden would make life difficult for England in the 2018 World Cup quarter-finals, the Three Lions booked their place in the semis of the showpiece tournament without any difficulties. Gareth Southgate’s troops took the lead in the 30th minute of the match, with centre back Harry Maguire heading the ball home after corner kick. The Swedes started the second half well, with the team creating a great opportunity to score in the 47th minute. However, Jordan Pickford did well to save Marcus Berg’s header, who rose above the opponent’s defence. England then created several chances to double their lead before Dele Alli made it 2-0 after 60 minutes. Sweden midfielder Viktor Claesson unleashed a shot to the left post, which failed to beat the keeper. England managed to defend their two-goal lead and they totally deserved to make it to the World Cup semi-finals. Russia and Croatia faced each other at Fisht Olympic Stadium in Sochi in the quarter-finals of the 2018 FIFA World Cup. Croatia missed a couple of good chances to score in the first ten minutes of the match, with Ante Rebic failing to break the deadlock. Russia were waiting for their chance and after 31 minutes they scored the opener in style. Denis Cheryshev scored a brilliant goal from long range after Artem Dzyub passed him the ball, but Russia’s celebration did not last long. Eight minutes before the half-time break Mario Mandzukic picked out Andrej Kramaric, with the Hoffenheim attacker scoring the equalizer with a fine header. Both teams then decided to slow down the tempo of the match, which eventually went into extra-time. The Croats scored first in the extra-time, with Domagoj Vida planting a header inside the right post. Nonetheless, Mario Fernandes did well to level the score (2:2) in the 115th minute of the game. Zlatko Dalic’s men eventually won the penalty shoot-out lottery and set up a meeting with England in the World Cup semis. Each £1 in this accumulator would reward you £2.17 in return! Despite being regarded as hot favourites to beat Japan in the 2018 FIFA World Cup last 16, Belgium experienced all sorts of problems at the back in Monday’s football match against the Samurai Blue, who took the lead three minutes into the second half. Haraguchi scored the opener for Japan, with Inui doubling their lead four minutes later. However, Belgium coach then made two crucial changes, with Fellaini and Chadli coming as substitutes. Jan Vertonghen’s header helped the Red Devils get back into the game in the 69th minute and five minutes later Fellaini scored the equalizer for Roberto Martinez’s troops. When everybody in the stadium expected that the match will go into extra-time, Nacer Chadli scored the winner for Belgium from close range. It has to be noted that Keisuke Honda could have helped Japan make it to the quarter-finals in the third minute of the stoppage time, but Belgium goalkeeper Thibaut Courtois did well to deny his long-range free kick. Colombia and England faced each other at Otkrytiye Arena in Moscow in the last 16 of the 2018 FIFA World Cup finals. The Three Lions broke the deadlock after 57 minutes, with Harry Kane scoring the opener from the penalty spot. Gareth Southgate’s men then decided to defend their lead and they were on the verge of beating los Cafeteros in the regular time. However, the Colombians decided not to give up on their quarter-final dream and Barcelona defender Jerry Mina scored the equalizer in the dying minutes of the match. Both sides missed a couple of chances to score the winner in the extra-time, but the winner was eventually decided in the penalty shoot-out. England goalkeeper Jordan Pickford saved Carlos Bacca’s penalty in round 5, with Eric Dier eventually helping the Three Lions book their place in the quarter-finals of the showpiece tournament. A place in the quarter-finals of the FIFA World Cup was at stake when Brazil and Mexico faced each other at Cosmos Arena. The Mexicans played well in the first half of the match, but they eventually failed to turn their dominance into goals. However, the Brazilians dominated the second half of the game, with the South American giants opening the scoring after 51 minutes. Neymar scored the opener for the Selecao, with Willian missing a clear-cut opportunity to double Brazil’s lead eight minutes later. In the 88th minute of the match substitute Roberto Firmino put the game to bed, with the Liverpool attacker blazing home from close range. Raul Jimenez could have scored a consolation goal for Mexico in the dying seconds of the match, but the ball hit one of the defenders and bounced away. Taking everything into account, Brazil totally deserved to book their place in the quarter-finals of the showpiece tournament. We are destined to hit more accas! The accumulator special was focused on three games being played in preparations of the World Cup 2018! Portugal and Morocco faced each other at Stadion Luzhniki in the second group game at the 2018 FIFA World Cup finals. Portugal broke the deadlock after just four minutes thanks to Cristiano Ronaldo’s close-range header. Morocco then started dominating the game and it has to be noted that they created several clear-cut chances to level the score. Mehdi Benatia could have scored the equalizer, but his long-range header was not powerful enough. Younes Belhanda had the first chance for Morocco in the second half in the 57th minute of the match, but his header from the penalty spot failed to beat Portugal goalkeeper Rui Patricio. Fernando Santos’ men defended well in the remainder of the match and eventually recorded their first win of the process. Speaking of statistics, Morocco had 16 goal attempts, whereas Portugal had shots on goal. Anyhow, the Moroccans suffered elimination in the group stages of the 2018 FIFA World Cup finals. Even though many people expected that Peru would make life difficult for France at Ekaterinburg Arena, les Tricolores recorded yet another hard-fought win at the 2018 FIFA World Cup finals. Didier Deschamps’ troops broke the deadlock in the 34th minute of the match, with talented striker Kylian Mbappe scoring his first goal of the tournament. The PSG attacker tapped home from close range after the rebound fell kindly into his path and nine minutes later left back Lucas Hernandez missed a chance to double the lead. Les Tricolores defended well in the second half of the match and, taking everything into account, they totally deserved to book their place in the last 16 of the showpiece tournament. It has to be noted, though, that Luis Advincula created a good chance for himself in the 68th minute, but he eventually failed to find the net. As expected, Belgium outclassed Tunisia (5-2) in their second group game at the 2018 FIFA World Cup finals. The Red Devils proved their worth in the triumph over the African side, with Romelu Lukaku adding two more goals to his account. Eden Hazard opened the scoring for Roberto Martinez’s troops after six minutes and ten minutes later Romelu Lukaku doubled their lead. Bronn then gave Tunisia fans a reason for celebration as he found the net following Wahbi Khazri’s assist. When everybody expected that the referee would blow the whistle for the end of the first half, Romelu Lukaku scored his second goal of the match and made it 3-1. Eden Hazard and Michy Batshuayi scored in the second half for the Red Devils as well, with Wahbi Khazri setting up the final score of the match – 5-2 in the stoppage time. Each £1 in this accumulator would reward you £3.10 in return! Many people consider Group H the weakest group of the 2018 FIFA World Cup, but Colombia could be the dark horses at the upcoming showpiece tournament. Los Cafeteros were producing fine displays in the qualifiers, with the team finishing the process in fourth place in the standings, but they need to improve their game if they are to record a good result at the World Championship. James Rodriguez has found his best form of late, but his goal in a 2-2 draw with Real Madrid did not help Bayern Munich make it to the Champions League final. Radamel Falcao is enjoying a very successful season with Monaco as well and the “Colombian Tiger” will be yet another man to watch in Jose Pekerman’s team at this summer’s tournament in Russia. Poland national team is all about Robert Lewandowski, who is enjoying yet another successful season. The Bayern Munich attacker scored 16 goals on the road Russia and, no doubt, all eyes will be on him when the Poles take on Senegal on June 19 in their World Cup opener. The Eastern European side failed to impress at the 2006 tournament in Germany, but they are widely expected to make it to the 2018 FIFA World Cup knockout stages. Adam Nawalka is doing great job with Poland and we predict that they are going to prove their worth on the field. The likes of Piotr Zielinski and Kamil Grosicki should help Robert Lewandowski add more goals to his account at the upcoming tournament. Thanks to a 2-0 win over Australia Japan booked their place at the FIFA World Cup finals for the fifth consecutive time. The Samurai Blue failed to impress at the showpiece tournament in Brazil four years ago, with the team losing to Ivory Coast and Japan in the group stages, whilst playing out a goalless draw with Greece. The Asian side will have a big fish to fry in matches against Colombia and Poland, but, one they should never be underestimated. Keisuke Honda is not getting any older and the former Milan ace, who score seven goals in the 2018 World Cup qualifiers, will play the main role in the Japan national team at the tournament in Russia. Against all odds, Senegal made it to the 2002 World Cup quarter-finals, but they failed to qualify for the last three major tournaments. The Lions of Teranga are back to the World Cup finals and it seems as if they have never been stronger. Saido Mane, who helped Liverpool set up a meeting with Real Madrid in the Champions League final, is the team’s key player, but fellow Premier League star Diafra Sakho could play an important role in Aliou Cisse’s team at the 2018 World Championship as well. Speaking of the team’s defence, all eyes will be on Kalidou Koulibaly, who has established himself as a first-team regular at Napoli. Koulibaly scored the winner for the Neapolitans in the Serie A derby against Juventus, but that is unlikely to help the Partenopei clinch their first Scudetto since 1990. Colombia and Poland are considered favourites to finish the group stages in the first two positions, but Saido Mane and Co. could spoil their party in Russia. Anyhow, Japan have slim chances of advancing to the last 16 of the 2018 World Cup finals. Belgium booked their place at the 2018 FIFA World Cup finals in style, with the team collecting 28 points from possible 30 in the process. The Red Devils must be high on confidence ahead of the start of the tournament in Russia, but coach Roberto Martinez must warn his men against complacency. Kevin De Bruyne, Eden Hazard and Romelu Lukaku are the team’s key players and the trio should pose a big threat for Belgium’s rivals in Group G. Roberto Martinez has a number of top-class footballers, but it remains to be seen if the former Everton boss is going to help Belgium national team improve teamwork, which was the team’s main problem at the 2014 tournament in Brazil. Here we go again. England are on yet another quest to win the World Cup, but they are not listed among main favourites to win the prestigious trophy. The Three Lions once against impressed in the qualifiers for the major tournament, but they will have to be at their sharpest at the 2018 World Cup finals if they are to win their first major trophy since 1966. Harry Kane, who is enjoying yet another season to remember, is undisputedly the team’s key player, but Manchester City winger Raheem Sterling is expected to impress at the upcoming tournament in Russia as well. England failed to impress at the 2014 World Cup in Brazil, with the team losing to Italy and Uruguay in the group stages, whilst sharing the spoils with Costa Rica. Thanks to a controversial victory over Costa Rica in their last qualifying match, Panama booked their place at the FIFA World Cup finals for the first time ever. Los Canaleros have nothing to lose at this summer’s tournament in Russia as they have been grouped with Belgium, England and Tunisia. Hernan Gomez’s men are likely to leave their hearts on the field in every single match and, no doubt, they would be more than satisfied should they happen to record their first ever win at the World Cup finals. Defenders Roman Torres is considered the team’s key player. Despite playing out a goalless draw with Libya in their last qualifying game, Tunisia clinched their place at the 2018 FIFA World Cup finals. The Eagles of Carthage missed previous two major tournaments and you should know that they recorded their last win at the World Cup back in 1978, when they defeated Mexico in the group stages. The Tunisians will have a big fish to fry in matches against Belgium and England, but they are definitely capable of making life difficult for Panama in their last group game at the 2018 FIFA World Cup. Coach Nabil Maaloul doesn’t have a number of world-class players to choose from, but the team is well balanced and they should not be written off just yet. Anyhow, we predict that Belgium and England are going make it to the knockout stages as the lack of experience at major tournaments should prove to be a big problem for both Panama and Tunisia at the 2018 FIFA World Cup finals. Thanks to Mario Gotze’s goal Germany defeated Argentina in the 2014 World Cup final, but the highlight of the tournament was their historical 7-1 triumph over Brazil in the semis. Joachim Low’s troops are now on a quest to defend their trophy, but their performances in 2018 friendly games are not giving fans a reason for optimism. Joachim Low, though, used those warm-up game to test as many players as possible and, no doubt, the Germans will be at their sharpest when they square off against Saudi Arabia in the opening match of the 2018 World Cup finals. 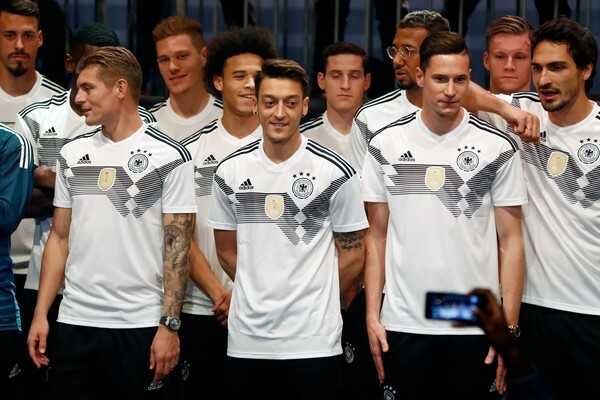 Low has a number of talented footballers to choose from, but the likes of Toni Kroos, Mesut Ozil and Mats Hummels will once again play the main roles in the German national team. The good news is that first-choice Manuel Neuer should be fit for the World Cup, but defender Jerome Boateng is rated doubtful. Despite being regarded as underdogs in the play-offs against Italy, Sweden did well to book their place at the 2018 World Cup finals. The Swedes managed to beat the odds and, no doubt, they are brimming with confidence ahead of the start of the tournament in Russia. Los Angeles Galaxy star Zlatan Ibrahimovic could re-join Sweden national team, but, as things stand now, he will not take part in the 2018 World Cup finals. Great teamwork is Sweden’s main characteristic and, one thing is for sure, they are going to leave their hearts on the field in every single match. The Nordic side face Korea Republic on June 18 in their opener and you should bear in mind that it has been 12 years since they played their last game at the World Cup finals. Over the years Mexico have established themselves at the regular participants of the major tournament. El Tri failed to qualify for the 1990 World Cup finals, but they have been playing at the showpiece tournament ever since. The Mexicans suffered only one loss in the qualifiers, with the team losing to Honduras in the last game of the process. However, it is important to note that they faced La Bicolor with the lack of motivation. Carlos Vela, who scored three goals on the road to Russia, will be the man to watch in Juan Osorio’s team at the 2018 FIFA World Cup finals. Despite failing to impress in last three qualifying games against Qatar, Iran and Uzbekistan, Korea Republic clinched their spot at the 2018 FIFA World Cup finals. The Koreans have been handed a tough draw as they will face the likes of Germany, Sweden and Mexico in Group F, but the good thing is that they have nothing to lose in the group stages of the tournament. Tottenham ace Son is likely to pose a big threat for the opposition defenders and they should have him at bay. Anyhow, seeing that they were playing below expectations in the qualifiers, Korea have slim chances of booking their place in the last 16. Given the experience and quality of German footballers, Joachim Low’s charges are likely to clinch top position in Group F, with Mexico and Sweden likely to fight hard for the second place. South Korea, in our opinion, are unlikely to advance to the knockout stages of the 2018 FIFA World Cup. Brazil suffered an embarrassing 7-1 loss to Germany at the 2014 FIFA World Cup finals, but they quickly bounced back from it. The Selecao impressed in the 2018 World Cup qualifiers and, as a result, they are considered one of main favourites to win the prestigious tournament. Coach Tite is doing a great job with the Brazilian national team and the good news for the fans is that key player Neymar is likely to recover in time to face Croatia in the opening match of the tournament. The Brazilians have already got their revenge on Germany, with the team beating Joachim Low’s men (1-0) in a friendly in Berlin, but their main goal is to conquer the title holders at the 2018 FIFA World Cup finals. Despite the fact that coach Slavoljub Muslin helped Serbia qualify for the 2018 FIFA World Cup finals for the first time since 2010, the experienced tactician will be not in charge of the “Eagles” at the showpiece tournament in Russia. Mladen Krstajic, who has been appointed as Serbia new coach, has some injury worries ahead of the 2018 FIFA World Cup as Schalke defender Matija Nastasic is likely to miss the tournament with a knee problem. Former Chelsea captain Branislav Ivanovic is rated doubtful as well, but the fact that Aleksandar Mitrovic has been scoring goals for fun with Fulham in 2018 is certainly giving fans a reason for optimism. However, the team’s key player is Manchester United midfielder Nemanja Matic and he is likely to play the main role in Mladen Krstajic’s team at the upcoming tournament in Russia. After impressing at the 2014 FIFA World Cup finals where they made it to the quarter-finals, Costa Rica will be looking to give fans yet another reason for celebration when they take part at the 2018 tournament in Russia. Real Madrid goalkeeper Keylor Navas is the team’s leader, but los Ticos should look sharp up front as well if they are to advance to the knockout stages. Experienced attacker Brian Ruiz is still part of the team and the Sporting CP footballer, who scored three goals in the WC qualifiers, will be one of the men to watch in Oscar Ramirez’s team. Over the years Switzerland have established themselves as one of the best European sides. The Rossocrociati were producing thrilling displays in the 2018 World Cup qualifiers, but Portugal eventually finished the process in top position in Group B. As a result, the Swiss faced Northern Ireland in the play-offs where they scored only one goal in 180 minutes. However, Ricardo Rodriguez’s goal proved to be the key moment of the double-header and it helped Switzerland qualify for the showpiece tournament in Russia. Xherdan Shaqiri has been in a fine form in 2018, meaning that Brazil, Serbia and Costa Rica defenders should have him at bay. Brazil have been producing splendid displays ever since new coach Tite took over the reins and seeing that Neymar is likely to be fit for the World Cup opener against Switzerland, we predict that the South American giants are going to clinch top position in Group E. The Rossocrociati, on the other hand, who are a very experienced side, are widely expected to advance to the last 16 as a second-placed team. Argentina were struggling in the 2018 World Cup qualifiers, but then Leo Messi put his “magical boots” on. The Barcelona superstar proved his worth in a 3-1 win over Ecuador in the last qualifying match and helped la Albiceleste book their place at this summer’s tournament in Russia. The South American giants have big ambitions for the World Cup finals, but they are not listed among favourites to win the prestigious trophy. Kun Aguero faces race to be fit for the opener against Iceland, but coach Jorge Sampaoli, who won Copa America with Chile in the past, has a number of top-class attackers to choose from. Anyhow, Argentina should not be underestimated, speaking of the World Cup trophy race, as Leo Messi is enjoying yet another season to remember. After taking part at Euro 2016, Iceland did remarkably well to qualify for the FIFA World Cup finals for the first time in the history of the national team. The Icelanders’ success is a product of teamwork and, no doubt, Heimir Hallgrimsson’s men are likely to play an important role at the upcoming major tournament and all eyes will be on Premier League star Gylfi Sigurdsson when Iceland take on star-studded Argentina in their World Cup opener, but only if the Everton midfielder recovers from a long-term injury. The Icelanders, will, as always, rely on their rock-solid defence in each and every of their three group games. Croatia were playing below expectations in the 2018 World Cup qualifiers. The Vatreni were struggling in matches against the likes of Turkey, Iceland and Croatia and, as a result, coach Ante Cacic got fired. New boss Zlatko Dalic then helped the team regain a much-needed confidence and thanks to a win over Ukraine in their last group game the Croats booked their place in the play-offs. Zlatko Dalic’s men impressed in the double-header against Greece and they totally deserved to clinch their spot at the World Cup finals. As always, Luka Modric, Ivan Rakitic and Mario Mandzukic will be the men to watch in the Croatian national football team, who are seen as one of favourites to finish the group stages in top position. Nigeria are considered underdogs in Group D. The Super Eagles impressed in the 2018 World Cup qualifiers, with the team finishing the process without losing a single game. The Nigerians booked their place at the showpiece tournament for the third consecutive time, but you should know that they recorded only one win in previous ten games at the World Cup finals. Rising star Kelechi Iheanacho, Chelsea wing-back Victor Moses and Arsenal winger Alex Iwobi are undisputedly the team’s key players and all eyes will be on the trio when Nigeria take on Croatia in their World Cup opener on June 16. At first glance, Group D is not balanced. Given the number of world-class players in their squads, Argentina and Croatia are expected to make it to the last 16, but Iceland and Nigeria should not be written off just yet. Both Iceland and Nigeria play as a team and they are definitely capable of making life difficult for the Vatreni and La Albiceleste.